2nd India Diamond Week is also being held on the sidelines of the WDC AGM and World Federation of Diamond Bourses’ Meet in Mumbai. The World Diamond Council (WDC) held its 14th annual general meeting (AGM) in Mumbai on October 22 -23, 2018 with a focus on reform of the Kimberley Process (established in 2000 to prevent ‘conflict diamonds’ from entering the mainstream rough diamond market) and WDC System of Warranties in support of a commitment to sustainable development by the diamond industry. The meeting was hosted by the Gem and Jewellery Export Promotion Council (GJEPC) at the Sofitel in BKC, Mumbai. This year’s event welcomed several new member organizations that strengthen the collective voice of the Council, particularly in Belgium, China and Africa. The agenda was to continue to focus on a push for reform, both externally in the Kimberley Process (KP) where the WDC serves as the industry’s observer and from within through changes to the industry’s System of Warranties (SoW). The SoW extends the assurances provided by the Kimberley Process Certification Scheme (KPCS) by requiring all diamond suppliers and diamond jewelry manufacturers to pass on a conflict free warranty statement each time diamond goods (rough or polished) change hands. Stephane Fischler, President of the WDC in his speech spoke about the past and the current status of the entire diamond industry. He spoke about how WDC is also encouraging KPCS reform focused in the areas of - broadening the scope of the KP to increase the likelihood of safe and secure working conditions, fair labour practices and sustainable development in diamond communities; establishing a permanent secretariat to strengthen long-term implementation of the Kimberly Process Certification Scheme and strengthening the KPCS minimum standards by strengthening the peer review mechanism. He appreciated the Indian diamond industry's efforts towards improving lives of its diamond workers. “World diamond industry should walk the path of sustainability. We should reform the way we do our business and reform should begin with self-regulation,” he added. Senthil Nathan S, Deputy Secretary, Commerce Ministry during his keynote speech urged the WDC and KP body to include measures to tackle money laundering and terror financing in the industry. The session on October 23rd was open to the press and it featured speeches from Pramod K. Agrawal, Chairman of the GJEPC; WDC President Stephane Fischler; Philippe Beke, FPI, European Commission; and key note speeches by Senthil Nathan S, Deputy Secretary, Commerce Ministry and Mr. A. Parthasaraty, known as Swamiji, a pre-eminent philosopher from Vedanta Academy in India. 2nd India Diamond Week is also being held on the sidelines of the WDC AGM. 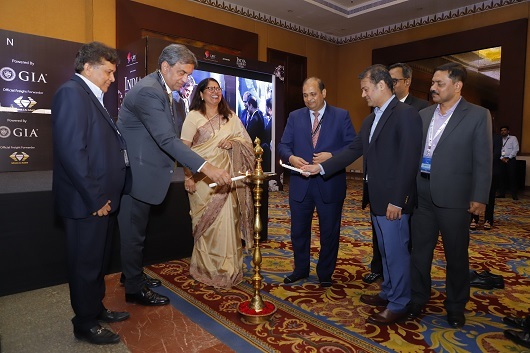 The IDW was inaugurated at The Lalit in Mumbai. This year, 120 buyers from 29 countries are visiting the India Diamond Week from all major key diamond markets of the world including the USA, China, Hong Kong, Israel, Russia, Europe, South Africa, Turkey, Middle East, Iran, Latin America, Australia, New Zealand, Indonesia. India Diamond Week 2018 was inaugurated by Pramod Kumar Agrawal (Chairman, GJEPC), Colin Shah (Vice Chairman, GJEPC), Dilip Shah (Convener-International Exhibitions, GJEPC), Sanjay Shah (Convener, Diamond Panel, GJEPC) and Sabyasachi Ray (Executive Director, GJEPC) in the presence of Senthil Nathan (Dy. Secretary, Ministry of Commerce & Industry, GOI). The Indian industry has been successfully following the Best Business Practices and complying with the world Business standards. Indian companies follow The Best Practice Principles, a set of ethical standards developed by De Beers to promote the highest business conduct in the diamond pipeline. In addition to the same the companies in India are following the System of Warranties on all their invoices as initiated by WFDB & WDC. Moreover, the GJEPC in the capacity of being a KP Import / Export Authority in India is working closely with the KP Chair, Ministry of Commerce & Industry, Government of India and the trade to implement and oversee the Kimberley Process Certification Scheme in India. India is the Vice Chair of KPCS for the calendar year 2018 and will handle the responsibilities of Chairmanship during the year 2019. GJEPC has created Sustainable Development through model programs for the health and welfare of its workers such as Swasthya Ratna. GJEPC plays a dominant role in global diamond advertising. For the generic promotion of diamonds, GJEPC has joined hands with Diamond Producers Association – DPA to fund the promotion of Diamonds and Diamond Jewellery with the sole objective to instil demand for the product at the consumer end. The overall media promotion funds allocated by DPA for 3 markets namely the USA, China and India are to the tune of US$40 million. GJEPC has contributed US$2 million to the Global promotion fund by the DPA. GJEPC is building state-of-the-art gemological laboratories that ensure diamonds are natural, well-crafted and ethically sourced.